Thank you for your interest in applying to become a wholesale vendor through our Market Mobile system. Please review our participation requirements before completing the application form. Applications are accepted at any time and reviewed on a monthly basis. WHY SELL ON MARKET MOBILE? Market Mobile is a cooperative delivery system designed around the needs of farmers and food producers in RI, MA, and CT. The online ordering software pools together sales, delivery, and invoicing so that you can focus on growing the tastiest food around. The result? Diversified small- and mid-sized farms can supply restaurants, schools, grocers, buying clubs, and other organizations across Rhode Island and the Boston metro area with one delivery to our packhouse in Pawtucket, RI. The first Market Mobile delivery was in January 2009 to three Providence restaurants. Word got around quickly, and additional wholesale customers began to participate, making new delivery routes from Providence to Newport and Boston possible. Today, having regional delivery routes in areas throughout Rhode Island and Eastern Massachusetts is what allows Farm Fresh RI to engage schools, hospitals, and other large buyers whose purchasing practices often require longer conversations or prohibit reaching out to individual local growers. Market Mobile is a wholesale local foods distribution program. We aggregate orders from farms and artisan producers in RI, MA, CT and occasionally other New England states, and deliver to restaurants, grocery stores, and other customers in RI and the Boston metro area. All products sold through Market Mobile must be grown and harvested from your farm. Any exceptions must be pre-approved by Farm Fresh RI staff and noted on the online order form in the comment section. Artisanal products must use at least one ingredient originating from family farms in RI, MA, or CT.
Any failure to comply with these requirements degrades our service as well as customer trust and satisfaction, and will jeopardize your future participation in Farm Fresh RI programs. Farm Fresh RI will visit participating farms and producer businesses on an annual basis for quality control inspections and to ensure crops are being grown on your farm. By participating in the Market Mobile system, you consent to such inspections. We reserve the right to suspend or terminate any participating farms or producers for violation of or non-compliance with Market Mobile rules. Market Mobile vendors must maintain all appropriate city and state licenses for their farm or food products and provide copies of these to Farm Fresh RI each year. All vendors must have proof of liability insurance. GAP or other third-party food safety audits are highly encouraged. All product labeling must be truthful and accurate, and adhere to the requirements set forth by the state of Rhode Island. Any claims, such as organic, pesticide free, free range, etc. must be substantiated. Any intentionally false claims will be cause for immediate removal from the system. Products must be delivered to our Packhouse in clean trucks and packed in clean boxes. Please do not pack items using staples or other small metal objects. Deliveries made in an uncovered flatbed or pickup truck will not be accepted. Dairy items must be under 40° F, and eggs under 45° F, at the time of arrival at our Packhouse. Product temperatures will be checked upon arrival, and products not at the correct temperatures will be rejected. All products must be labeled with the farm or producer name. We work to offer a balance of farm products and artisanal goods on Market Mobile to meet customer demand and ensure strong sales for all vendors involved. New applicants are accepted as our capacity grows and a greater supply of products is needed. Applicants are reviewed on a monthly basis. Market Mobile is a transparent wholesale marketplace. You set the prices for your products and can monitor sales in real time. Farm Fresh RI is a nonprofit organization. We use 18 percent of Market Mobile sales to cover the system’s infrastructure, operations, and administrative costs (like delivery trucks and drivers, insurance, order packers, packhouse management, direct customer service, and so forth). We communicate this to customers as well, so everyone knows how our system works. Please factor the 18 percent fee into your pricing strategy. 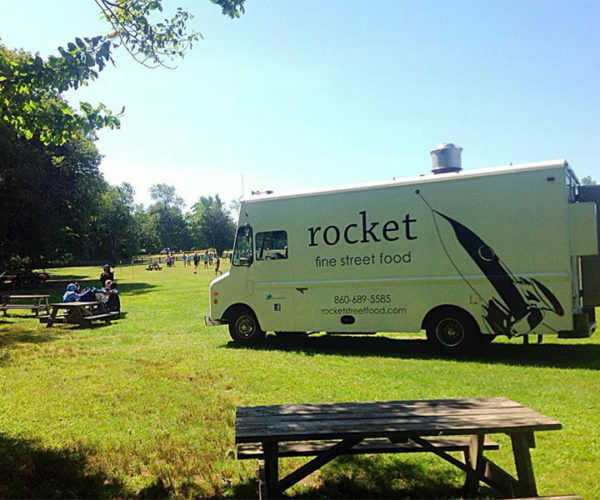 Market Mobile customer, Rocket Fine Street Food serves out-of-this-world hamburgers prepared with pride and care using Naturally Raised Black Angus Beef — raised with no hormones or antibiotics and primarily grass-fed on family-owned, sustainable ranches. Rocket’s menu uses the highest quality ingredients, in their purest form, often organic and from local sources.